Attempted (failed), November 18, 2007. How to get there: This peak is located near Ebensee, at the south end of the lake Traunsee. From Linz, this is 90 kilometer. First drive A1 about half way towards Salzburg. Exit south on Hwy. 145 towards Gmunden. Drive through Gmunden and continue south on Hwy. 145 along the west side of Traunsee. Just after a tunnel, you enter the town of Ebensee. Make an immediate right turn off Hwy 145, then another right after about 150 meter. There are signs for the gondola lift (Seilbahn) to Feuerkogel. 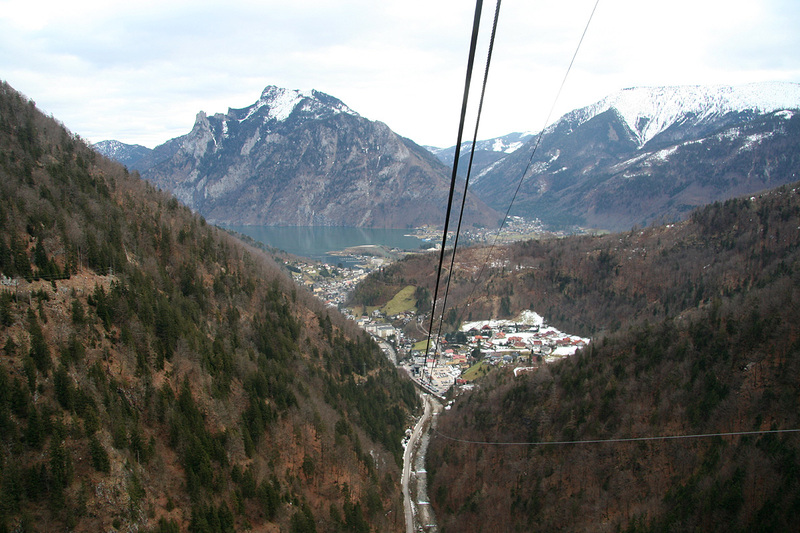 Drive uphill through parts of Ebensee for about 1.2 kilometer and park on one of the designated parking areas for the lift. This location is N47:48.770, E013:45.445, elevation about 485 meter. A. From the base. Hike or ski up the downhill slope that comes down to the lower lift station. This is a continuous, somewhat steep uphill. When it seems to top out, then continue the trail into the forest going right (when looking uphill). The trail/route continues steeply uphill before reaching the bottom of a (groomed) downhill slope served by a local lift. This location is N47:48.540, E013:44.123, elevation 1226m. Continue up the broad slope to the top of Feuerkogel, where the gondola top station is located, there are many buildings in this area. One need not go to the top station, but can keep a bit further left (south), this location is at N47:48.886, E013:43.145, about 1600 meter. From the top of the lift (Seilbahn) Taking the gondola avoids a steep climb of the downhill slope and gets you directly to better terrain for cross country skiing. A round-trip ticket was EUR 14.40 in early 2008. 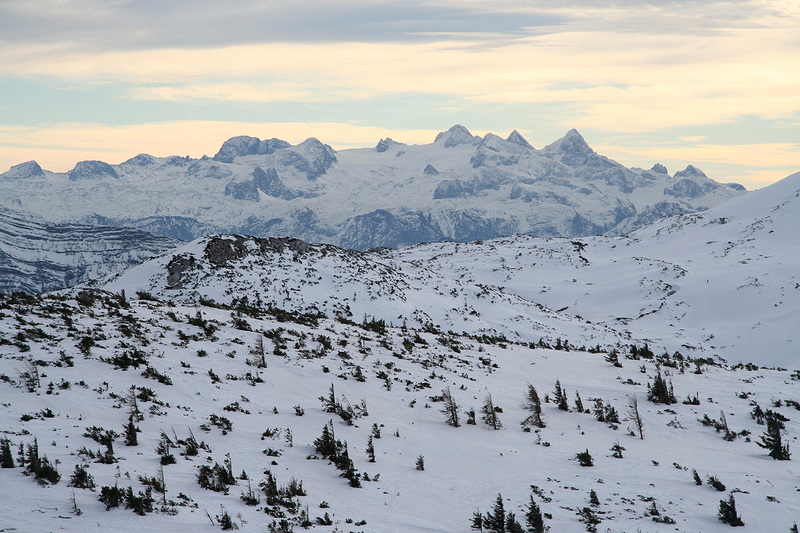 The route proceeds south-west between two local summits that are both served by smaller ski lifts. Ski down a small downhill slope in order to reach the valley floor between the two local summits. Climb gently to the small saddle that separates them. This is at location N47:48.752, E013:42.797, elevation about 1582 meter. Continue along the right side of the valley, the route now heads downhill and is marked with metal poles having a small, red disk at their end. After the downhill, the route again heads uphill, bearing left of the peak in front. A new saddle is reached and the marked route again descends before turning right and regaining elevation. It may be possible to gain a little elevation and contour the peak (that is on your right) rather than following the marked route (I did this). The route now climbs to a new saddle, this time the Grosser Höllkogel is visible at your left. This saddle is slightly above 1700 meter. The marked route continues gently uphill and curves right to reach the Riederhütte (1752m). However, as you approach the 1700 meter elevation, leave the marked route and climb the mountain on your left. There are many possible routes as the entire slope is quite gentle. I reached the summit ridge slightly right (when looking uphill) of the summit. 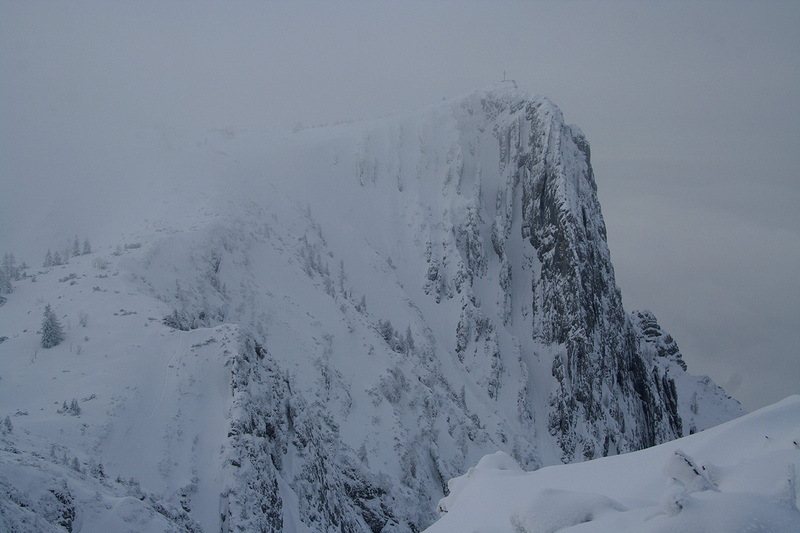 This ridge is broad and a very easy finish. A first attempt (November 18. 2007) that ended on Heumahdgupf. The weather on Saturday had been bad, but the forecast promised clear sky and sunshine to arrive in the Ebensee / Bad Ischl area after 1200, noon on Sunday. 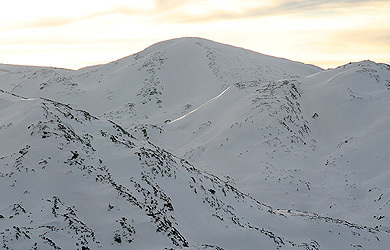 I studied options for a short ski climb and settled on Höllkogel. This peak is served by a lift that carries you up to almost 1600 meter and my guide book indicated that one could climb the peak in about 2 hours from the top of the gondola. Furthermore, the route did not involve any avalanche terrain, an important consideration after all the recent poor weather. In order to optimize wrt. weather and time, I left Linz shortly before 1100, arriving at the Seilbahn parking by 1200. I immediately noticed a sign that advised that the lift would be closed in November and reopen in December. Bad news for my plan, given the short days and the time, there were really no other option than to make a hike from the base. There was snow all the way down, so I could start skiing at elevation 485 meter, quite a bit below my planned starting near 1600 meter. It took me 2 hours to ski uphill to the top station. The hill had deep snow, but a few enthusiasts had already broken trail. Here, one definitely needs skins for the ski in order to follow established, steep uphill tracks. A woman (middle aged!) with a small pack with a ski helmet attached, caught up with me from behind about half way up. She passed, but her speed slowed somewhat and I saw her 50-100 meter in front for the rest of the climb. The second thing that failed today, was the weather. The promised sunshine never came, in fact I skied up into the clouds meaning fog and poor visibility. There were nobody else around. Fortunately, the woman was obviously a local with good knowledge and when she continued straight by (to the left of) the top station for the gondola, I had a slight hope that her destination would be Höllkogel. She proceeded up another moderately steep slope and stopped at the top. This place was also served by a local ski lift (closed) and obviously, was not Höllkogel. The location was N47:48.890, E013:42.749, elevation 1680 meter. The time was now 1430, the woman started her downhill ski and I looked around in the fog. There were steep cliffs to my right. A route could continue south-west, however, with the fog, and the unknown terrain as well as the time of day, it was clear that I would also declare this local summit to be my turnaround point. I carefully explored the terrain a little bit further, heading slightly downhill, then turned around back to the local summit. This summit turned out (consulting the map upon returning) to be Heumahdgupf, at 1680 meter. The top has only about 50 meter of prominence to the higher Alberfeldkogel at 1707 meter fairly nearby. I saw this summit in a brief moment through the fog, however, not that there in fact appears to be a fairly easy route across to it. With slightly more visibility I might have skied to it within my available time. I started my descent at 1500, reaching the car at 1600. Deep, steep powder, unfortunatey beyond my ability to ski well without my alpine skis. Still, I enjoyed this first day of skiing in Austria with plenty of snow everywhere. The second attempt (January 20. 2008). I took the gondola at 1210 and started skiing at 1220. In November, one could ski all the way from the base, now in mid January, the slopes were free of snow as high up as one could see. A round trip ticket therefore seemed most appropriate. The weather was cloudy, but the sun tried to break through. I quickly discovered that this trail was going quite a bit up and down, alternating. Thus, it would have been better with skivax than skins, however this was not an option. 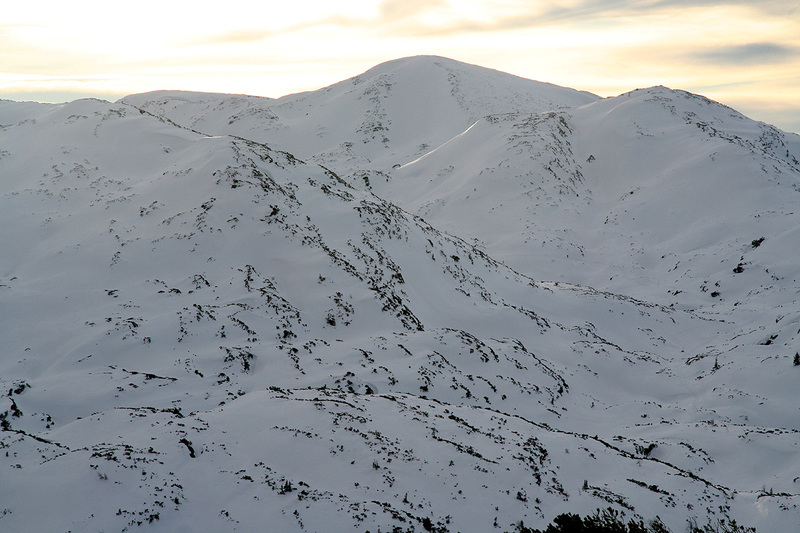 I skied along the marked route except for a small shortcut avoiding some loss of elevation. I soon came to the 1700 meter level and started skiing uphill. The wind was now quite strong and the snow was a mix of hard crust and softer patches. Skiing down would not be any pleasure, I therefore left the skis just below the 1800 meter level and hiked the last 10 minutes to the summit on foot, arriving there at 1350. As often is the case, the wind was not as strong at the very summit. I took some pictures, signed the nice summit register and chatted briefly with a man that arrived about 5 minutes behind me. It turned out that he had been on the same gondola ride. I left the summit at 1405 and decided to also visit the very interesting Alberfeldkogel that I had seen between drifting fog on my previous attempt. I subsequently traversered my "old friend" Heumahdgupf, the sun had set and the evening light on Dachstein was very special. Much closer, Grosser Priel dominates the view. I was back at the top station of the lift around 1550 and took the gondola back down at 1600. 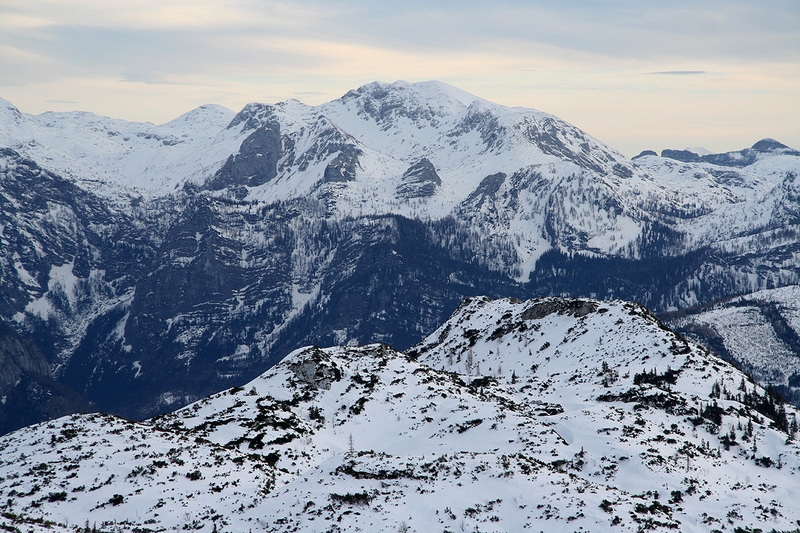 Höllkogel, (behind) as seen from Heumahdgupf on January 20. 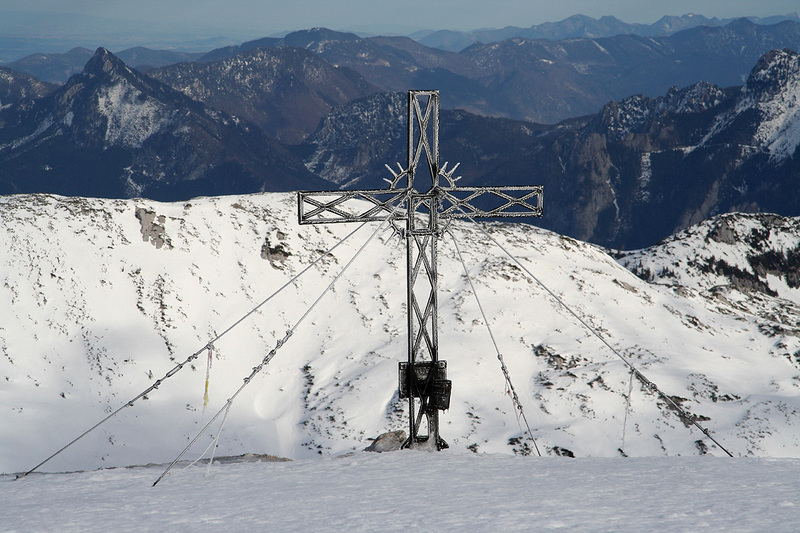 The summit cross on Höllkogel. 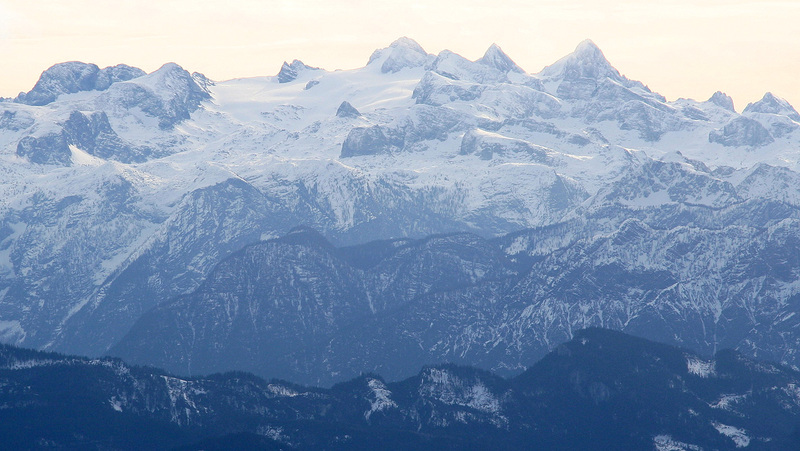 Dachstein, as seen from Höllkogel. 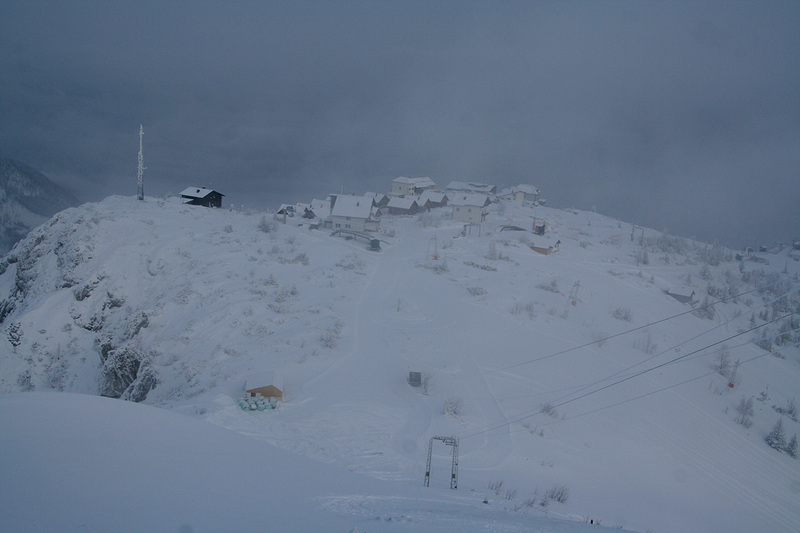 The ski area, as seen from Heumahdgupf on November 18.